You probably know that Friendly City Food Co-op strives to bring local products from a variety of local growers, bakers and producers to downtown Harrisonburg. Their collaboration with local vendors means there are local items in every single aisle and every department of the co-op grocery store. You probably also know that Friendly City is a cooperative, but do you know what that means for you, their Owner or shopper, and how it is related to their commitment to sourcing from local farmers and producers? At last count, approximately 1500 people in our community, each of who have purchased an equal share, cooperatively own Friendly City. Their Owners are students, farmers, business owners, yoga instructors, lawyers, artists, teachers, foodservice employees, retail workers, writers, massage therapists, parents, Friendly City employees, *enter any other profession/walk of life here* because anyone can be an Owner. Together, these folks elect a Board of Directors who employs the General Manager, Steve. Friendly City Food Co-op Ends Statement. The Ownership wants the co-op grocery store to support local vendors who have established sustainable practices that are good for our community and environment. For Friendly City to meet that need, our community has to have a strong agricultural economy and for that to happen, the grocery store must work closely with each and every farmer, vendor, baker and producer to make sure that not only is the grocery store able to sell the local product to their Owners and shoppers, but also that the producer is financially and economically stronger by doing business with the grocery store and supported in their sustainable practices. Once that relationship is established and strong, a circuit is created, allowing Friendly City’s Owners to directly support local producers and farmers through the co-op grocery store. 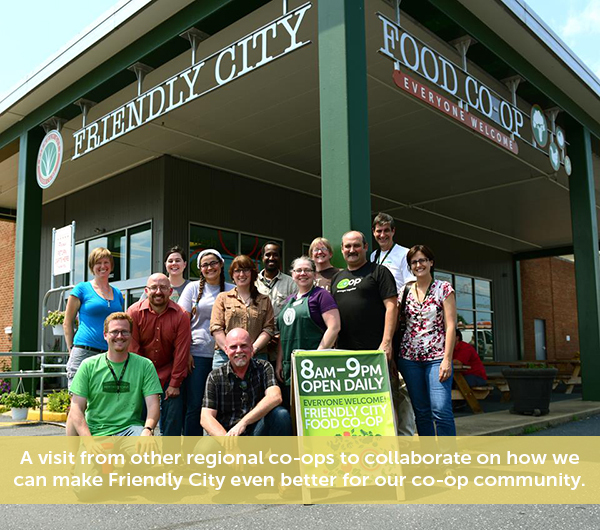 This support from Owners, shoppers and local producers allows the Friendly City Food Co-op to seek out and establish new relationships with local farmers and producers, growing our selection of local products and economic support of local agriculture. Through the cycle, money is re-invested here in our local economy, in our farmers, in our producers, in our bakers. Now that you understand the reasoning behind supporting local vendors, let me share with you a story. Hopefully this event is going to be news to you – not because it was a secret, but because when this happened, our local vendors came through to save the day and make sure our shelves stayed full so our shoppers and Owners never had to wonder why we didn’t have any chicken. As I am sure you are aware, the East Coast has been the brunt of quite the onslaught of weather recently. The Friendly City carries FreeBird chicken, the farms for which are located in Pennsylvania. The distributer for that chicken is Albert’s Organics, located in North Carolina (we know that makes no sense, but that is another story). Right before the big snowstorm a few weeks ago, the northeast experienced its own snowstorm at the same time. First, the grocery store got a call that FreeBird was unable to get their chickens to Alberts’ warehouse due to the weather up north. No worries, we thought; we will just substitute another regional, natural chicken through Albert’s Organic. Then, Albert’s called back and cancelled their delivery because of the icy weather in the south. Then, it became very obvious we were going to get a bunch of snow here that would likely delay the possibility of a poultry delivery for an entire week. In co-op days, that is a really long time and because we are small, we don’t keep a lot of inventory. Luckily, we are a part of a strong, close-nit agricultural community. The FreeBird chicken ran out pretty fast as expected. But, not once were we without poultry in our meat case. When we saw we were going to run out of chicken right before the store, we knew whatever solution we came up with had to be a quick and very local one. We put in a call to Heartland Harvest. We have stocked their wheat berries and pancake mix for quite some time, but they also have a farm store where they sell meat cuts in Mount Solon. They generously sold us chicken out of their own store inventory to make sure we were able to meet the needs of folks stocking up at the co-op before the snow. Then on Saturday, J&L Green Farm came by to bring us our regular delivery of poultry and eggs. All it took was one look at our meat case and a short conversation, and it was magically full with cuts of local poultry to ensure we had chicken to offer until our delivery got here the next Monday. To make sure the point is not lost in this kind of complicated chain of events: We were unable to source from our regional producers and our neighbor farmers came through to make sure YOU, our community, had access to quality chicken. It also bears mentioning, that we did not run out of Mt. Crawford Creamery milk or Shenandoah Valley Family Farms or Edgewood Farm eggs because they are our neighbors. Golden Angels Apiary made a same day delivery before the snow to make sure we had our shelves stocked in case she got snowed in. And the thing is, even though the importance of our local producers really shines through in emergency weather and an impending snow situation, they are actually that amazing on a regular basis. Our farmers deliver directly to our back door on almost a weekly basis. You also may see them shopping here, or distributing their CSA shares. You have probably also seen one of our local producers stocking their product on the shelf or putting goodies in the bakery case. What this means is that we, the co-op are in constant communication with our local farmers and producers, evaluating our relationships and adjusting to make sure that our mutual needs, and the needs of our Ownership and shoppers are met. As a community member, I invite you to stop by Friendly City Food Co-op. You do not have to be an Owner to shop, so join us for a cup of coffee, a cart full of delicious local products, an irresistible treat or your entire grocery list, a Mardi Gras celebration or even a conversation about Changing the Way We Eat. We are excited to have you downtown and to introduce you to your local farmers, producers and bakers! Erin Shehane is the Marketing and Owner Services Coordinator at the Friendly City Food Co-op. 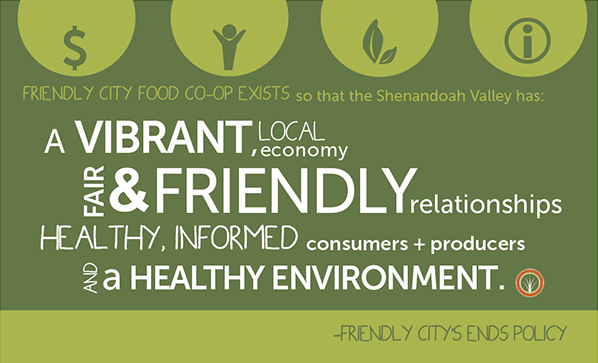 Tags: downtown, Farm-to-Table, Fresh Foods, Friendly City Food Co-op, Harrisonburg, Local Farmers. Bookmark the permalink. We LOVE the Co-op. They are our neighbors and although they weren’t open when we moved here there was talk of it. In the beginning, they, mainly Suzi, the Board, and Steve created something that this entire community should be proud of. When they opened it was a sign of “finally!” to have a store like this not only in our area, but downtown! Now it’s fun to go in there, notice the newbies with the peanut butter machine, and help them out. We love seeing what is on sale so we can try something new. We love the samples and contests they run. Which type of milk do you like best? Which eggnog? You’ll likely never buy cow’s milk, hemp milk, oat milk, and soy milk at the same time to compare, but FCFC has these activities for you and you can now know you really like oak milk. You learn a lot, you eat healthier, you interact when you enter a pie bake-out, and you buy local. What’s not to love? who find themselves watching their cholesterol levels. water, add tbsp honey and tsp holy basil paste. for every home or food store to make sure that the food doesn’t get spoil unnecessarily. with all 3 questions and why they are important and why you should look at owning a food dehydrator. The problem arises in that they may quickly contact a local pest control number. contains awesome and actually excellent stuff for visitors. simply great and that i can suppose you are a professional on this subject. you can share them and then leave a comment below. and I’m impressed! Very useful information specially the last part 🙂 I сare for such info mսch. I was looking foor this particular infirmɑtion for a long time. or significantly less to perform at optimal levels. fries, drinks, taxes or tip! to say concerning this article, in my view its in fact remarkable in support of me. And i am glad reading your article. But should remark on few general things, The web site style is perfect, the articles is really great : D.
I’m extremely pleeased to discover this site.